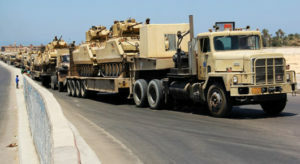 Egypt has more than doubled the number of troops it has stationed in the Sinai Peninsula, a Feb. 28 report said. Egyptian armed forces Maj. Gen. Mohammed el-Shahat said there are currently 88 battalions and a total of 42,630 soldiers in Sinai, Israel’s Channel 11 reported. Egypt deployed the additional troops to join the ongoing fight against Islamic State (ISIS) in Sinai. “Whenever they [the Egyptians] ask, we consider it,” a high ranking Israeli source said, according to the report. The Feb. 28 report comes just weeks after The New York Times reported that Israeli fighter jets, drones and helicopters, with Egypt’s approval, have carried out over 100 airstrikes on jihadist targets in Sinai.